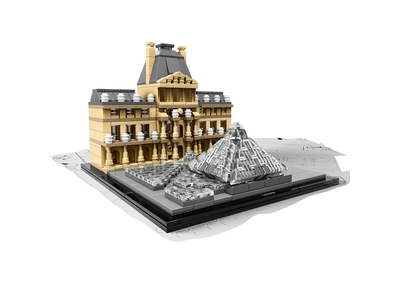 Build a LEGO® brick model of the Louvre, the world’s largest museum of art. Located in the heart of Paris on the bank of the river Seine, this magnificent structure, renowned for its striking blend of Renaissance and Modernist architecture, welcomes over 9 million visitors a year and houses over 35,000 works of art, including Leonardo da Vinci’s Mona Lisa. The Louvre started life as a fortress, built by King Philip Augustus in 1190 to protect Parisians from foreign invasion, and has since undergone a number of renovations. The result is the architecturally stunning Louvre we know today. This detailed LEGO model features the prominent Pavillon de l'Horloge and the iconic, once controversial glass pyramid designed by the renowned Chinese-American architect, I. M. Pei. Price is 31% above the initial Lego retail price! This comes down to 12.22 cent per brick. The Louvre (21024) Lego set is no longer directly available from the sites below. However, 3rd party partners of these sites might still have the set available. Alternate description Recreate the magnificent Louvre with this detailed LEGO® set, featuring the Pavillon de l'Horloge and I.M. Pei’s iconic Pyramide du Louvre.